This mother hen looks so happy with her child, what a wonderful loving bento! I just talked with my boy about the Kissing Hand, where he holds my kiss in his heart forever. Thank you for sharing this special bento with us! oh my! this is so cute!! :-) I love it. Happy Mother's Day to you... a FANTASTIC mom! Oh my~ this is a super duper cute mummy..:P The egg sheets's looks perfect in the natural colour. Happy Mother's Day Lia~ Cheerss!! @96753girl : Thanks a lot for your nice words! Yeah we celebrate Mothers' Day on 9th May. Happy Mothers' Day Lia! 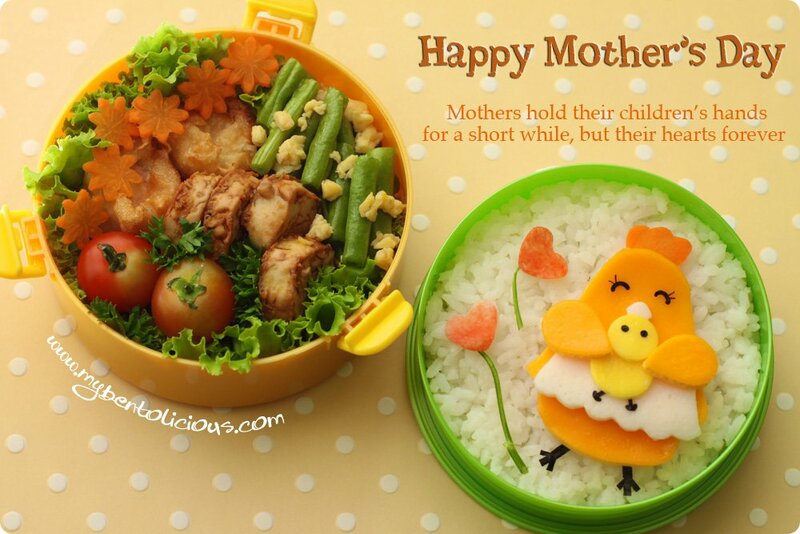 What a sweet Mother's day bento and it looks so tasty. @仪仪妈咪 : Thanks a lot 仪仪妈咪! Mother's Day in Malaysia is on May, 9 too right? So Happy Mother's Day to you ... and have a great weekend :) Hope you get a wonderful surprise later! @Indonesia_Eats : Thanks a lot Pepy! That is so perfect. I love that show of love between mummy n baby. :) Well done Lia! @SIG : Thanks a lot for the nice comment here :) Happy Mother's Day! WOW! this is really super cute. 母鸡抱小鸡! Really makes me smile. @Anncoo : Thanks a lot Ann! 我也给你一个抱抱，好吗？hehehe :) Happy Mother's Day to you! happy mother's day -- hope you have some wonderful time with your family! Such a 慈祥looking mother hen, and cute little chick :p Happy mother's day and a great weekend to u! @megan : Hi Megan! Miss you and your post ... I'm sure you will be a great and loving mom too someday :) Thanks a lot dear :) Have a nice weekend and have fun with the new apartment! Oh wow, awesome blog you have here! Your bentos look fantastic and divine I'll have to say! Great job. Happy Mother's Day to you too & have a fabulous weekend! So happy mommy hen and little chick! They never look like handmade stuff. You did a great work. Yellow box also looks SO great, yum! interesting that there are so many different kinds of eggs around. great idea to get different colours.